Installing a ceiling fan is a little more complicated than the do-it-yourself proponents would have you believe. You have a lot to worry about – correct wiring, energy efficiency and consumption, how the fan is affixed to the ceiling supports, whether or not there is a light kit on the fan and how it will work, proper balance and leveling to prevent wobbling – these are all important components of ceiling fan installation, and if you don’t do them correctly it could not only look bad but be downright dangerous to you and your family. What happens if I do try to do it myself? If the ceiling fan wiring is incorrect, it could result in circuit breaker trips, or even blown fuses. Having a fan wired incorrectly could even result in electrical fires. 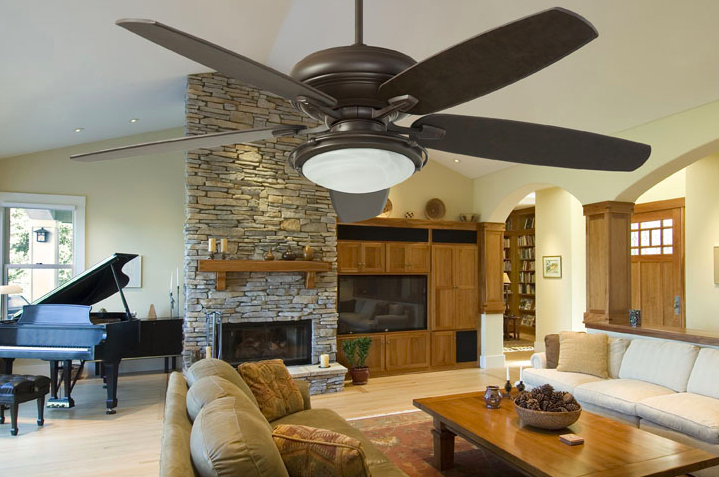 If you don’t have the fan attached to a strong center support beam, the motion of the oscillating fan blades could eventually work the fan loose from its screws – the last thing you want to happen while you’re sitting on your couch watching TV is for your ceiling fan to crash down in the middle of your coffee table! Wobbling can also occur if the fan isn’t installed properly, to begin with. You may think you should install your fan yourself to save a little money, but you could end up having to pay later in order to troubleshoot or repair ceiling fan electrical problems. Our certified electricians can install a ceiling fan in the time it would take for you to decipher the cryptic illustrations printed in the instructions that came with your fan. We will make sure your ceiling fan is installed properly, and that it will give you and your family years of safe, pleasant climate control. Determining the best location for the fan based on the location of the strongest ceiling joists. Or, if the joists aren’t centered where you want your fan (in the center of the room, above your bed, etc. ), then our electrical contractors can install a mounting bracket between the joists. We will make sure your fan is secure. Determining the correct UL-rated electrical box for your ceiling fan. Don’t opt for a do-it-yourself installation, only to spend money later on expensive repairs. It’s not worth it! Contact us now!